1. There was a pet possum at the Earth Day festival the other weekend. Pierce and I got to pet it. It was so calm, considering all the stuff going on. 2. I have been trying to find a pair of those ballet flats everyone wears that are comfortable. But they kill my feet. Do they just need extensive breaking in? I've tried several different types. Maybe I'm just better suited to flip flops. 3. Speaking of flip flops, my mom bought me a pair of Fit Flops when I was pregnant with the twins. I wore them constantly, year round. Most comfortable shoes ever - I'd walk miles in them. Sadly, last month they broke. I'm so bummed - and I heard they don't make them anymore! 4. Last week I picked off my first deer tick of the season. I think we need to order more guineas! 5. I need to update my blog header (which is almost a year and a half old) and I'm thinking the above picture is a definite contender for the new header. Readers, how often do you update your headers? Oh Lisa I love that photo it would be great in your header. I have never seen a possum but I have heard we have them. I cannot wear ballet flats because I have a very high arch in my foot and those shoes have no support. Perhaps you are the same. Try slipping the proform inserts or the inserts out of your running shoe into them and see how they do. I have a catalog with fitflops, but the design is different and they are all ugly. I still need to stop at the store up near valley view where I bought yours and see if they have them. Hank pulled a tick out of my head yesterday. Creeped me out. Bet we are in for a bad tick year. Need to remember to spray whenever we go outside. I make fleaspray with essential oils and spritz the dogs before we walk out the door. Should do the same to myself. I think the picture is perfect for the header. I have a few pair of flats that are comfortable and a few that only get worn for a short period of time. Oh my goodness...look at that picture! I've never pet one before. I think it's a great choice for up top. And I think you need one for a pet! I used to wear flats all the time. I swore they were super comfortable. At maybe at first they were, but I've had them for so long they're so worn! I'd gotten two pairs of short wedges to wear with my work clothes this past winter and since I started wearing them, I've deemed them so much more comfortable than my flats. Though I must say, nothing beats the comfort of a good pair of flip flops! I fell for a cute pair of red ballet shoes with bow, but once home I knew they weren't for my feet so like Beth says I moved on and they moved out to a friends..I would like to change my header but am not having much luck..your photo would make a great header..
Great photo with the opossum. I just learned that the opossum doesn't have a very long lifespan -- in the wild or in captivity. Interesting animal and important to the environment -- likes eating bugs! I can't wear flip flops! Can you take your flip/flops to a shoe repair? I change my header with the seasons ... sort of...!!!! Happy Friday! The possum pic would make a nice addition/change to your header pics. Somewhere, I have pics of my Monkeys holding a young alligator at a festival. They thought it was really cool! I think the photo would be a sweet header, I cannot wear flat ballet like shoes thought I keep trying and keep failing to keep them more than a week..changing my header is always a nerve wracking event, I've done it twice and am trying to work my nerve up to do one soon. Good Morning, Lisa! Can't help you on the shoe thing. I wear tennis shoes most of the time or cowboy boots. I always have a good pair of shoes on so I can run out the house when the Hubby needs help. No ticks here, still to cold. I update me blog header with the seasons. So 4-5 times a year. Some gals update every month. It's fun and refreshing, but I don't always have that much time. Too bad about your fit flops. I have never been able to wear flip flops are sandals. I pretty much live in tennis shoes. This is a precious photo for your header. Hope you guys enjoy the weekend. I love flip flops too. We've had two ticks so far but no only dog ticks...no deer ticks...YET. I update frequently only because I get very bored very easily! LOL. Such a cute picture! I remember when I was little we had a litter of possums in the basement..I don't remember why; I think we had the mama too. It wasn't for long but I do remember petting the babies and thinking how cute they were! I have two pairs of fit flops and love them. I just googled for you and I see that Amazon has them. I do not like those ballet shoes at all. I love the photo! Larry's cousin rescued a baby possum--his mom had been killed in the road--and kept him for a few years before he died. He loved to eat cookies. I never met him but saw pictures and heard lots of stories. I'm not much on flip flops. I trip easily in them. But I had a pair of Earth Shoes that I wore out wearing them so much. So comfortable. I am past the point of wearing anything on my feet that doesn't feel good. I do not want any more injuries! I really need to do some research on how to change my blog header. It's so plain. I would love to pet an opposum! I rarely update my header - NOW, you've got me considering . . .
Maybe two years ago a baby found a way into the laundry room to have a nibble of cat food. I was super surprised to see it - IT knew the feast was spread and he/she'd gotten the invite. It gave me a look like, "what?" It left the way it entered - and I patched up the entryway . . . oooh, what a surprise. I think that photo should be a great contender too! And I found the first tick of the season too. Oh how I hate them!!! Have a positively wonderful weekend!!! I have never heard of this brand of flip flops, but they must be good for your feet. This picture is one that should really go on your header!!!! 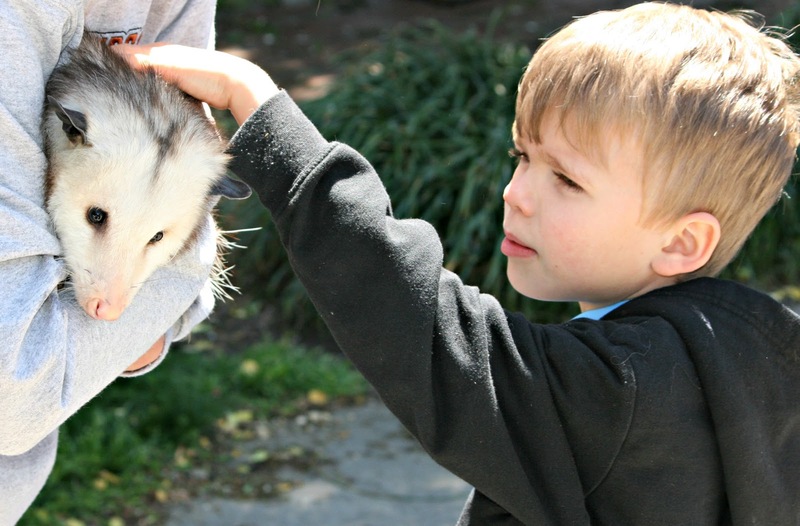 It has everything...the white face of the possum, and the look on Pierce's face, the tenuous petting. Pssum pet is unusual. I like how primitive they are.I haven't changed my header for a while, maybe it is time for me also. Only sneakers for me. My feet are very finicky. I love the photo. Definite header pic! Definite contender for the header; he's so stinkin' cute! Hope you have a good weekend. We're being inundated with rain here; in fact my driveway is half washed away. Woah, what a cool photo! We have possums around here that eat the cat food if the cats don't finish it, but my husband won't let me pet them haha. I like to update my header with each season, so I will change it every 3 months or so. My computer crashed right after I made my header and button. I lost it all. I should remake it. That means I have to redraw the text in my case to. I'll wait until summer when my students are done with class. My Dad had a live trap and took a possum in my bedroom when I was sleeping. I was a teen. It hissed at me. I haven't liked them since. The one Pierce is petting looks so nice though! I change my header whenever I feel like it. LOL! Sometimes more, sometimes less. Petting possum's at a pretty perfect place- what fun! I think an Opossum might be what is digging holes in my yard... They are cute but can do a lot of damage. What a cute possom. We had one in our barn, and it was a little stinky! We never have updated our header. Someone did this one for us long ago- and we don't know how. I live in flip flops and have about 12 pairs. :) Have you checked on ebay? Adorable possum. Must confess I've usually only seen them dead and didn't realize they were cute ... have a great weekend! Looks like a sweet little possum. I googled Fit Flops and it seems like they are still around unless they are not the same ones. Sorry about the ticks. There was a pet opossum at a nature conservacy where I was volunteering in Boca Raton years ago (for a class). They took the baby from the mama's pouch, the mama'd been hit by a car and didn't make it. They named her Patty. She was very nice! Oofos shoes are comfy (or so my hubby swears) and if you contact the PR rep, they sometimes have some for bloggers to review/giveaway, if you're interested in checking. I do a site redesign every couple years, I think. I swear I thought possums were mean!!! Petting a possum would not be on my to-do list! I have updated my header.. maybe three times in 7+ years? The possum looks very sweet. I changed my header picture, ONCE, after hours of cring and loosing my blog, I vowed to never do that agin!! You know how I feel about flip flops. I wear them year round and could not live without them!! Life is definitely better in flip flops!! Have a happy Sunday, love today's image!! Flip flops are indeed the most comfortable footwear indeed! And I have updated my header 3 times in 3 years! So I too change it once in a year on an average! Great photo! 'Course you'd have to balance it with pics of the other kids. I'm a big fan of Arcopedico shoes. Not the knit ones, the leather ones. I buy them online cuz I can't find them in stores. We have possums around here all the time, but I wouldn't go near these jokers! They are mean. Check Amazon or Ebay for the Fit Flops, you can find darned near anything there. Nice catching up with your Random 5! That possum is so cute! The problem with the flats is that there is NO support and your foot just sort of squishes around in them. I can't wear them either--they make my feet hurt. LOVE the opossum! We have a few in our yard--and while I like them, I don't like the poops they leave in my garden. My neighbor blames my cat for the poops when it is the opossum. Ugh. I was thinking of updating my blog header too. I only do it every couple of years because I just don't have time to play with it and I end up paying someone else to do it. I have never found a pair of flats that are comfortable either but my daughter has lots of pairs of them. We don't pet possums around here ;) But it is a CUTE photo for a new header!